There’s a loud bang, everybody jumps, the pigeons fly away to return seconds later. Where was the explosion? you hear visitors to Cape Town ask. This place is dangerous. We must leave at once. The visitors look around them. Everybody is going about their business as if nothing has happened. Look at your watch. It’s noon and the explosion you have just heard is the noonday gun. Every day, Monday to Saturday at noon the gun is fired and has been for the past 194 years. The tradition started in 1806 when the gun (cannon) was first fired from the Castle of Good Hope on the beach front in Cape Town. It was fired to advise the ships in the bay that it was noon. 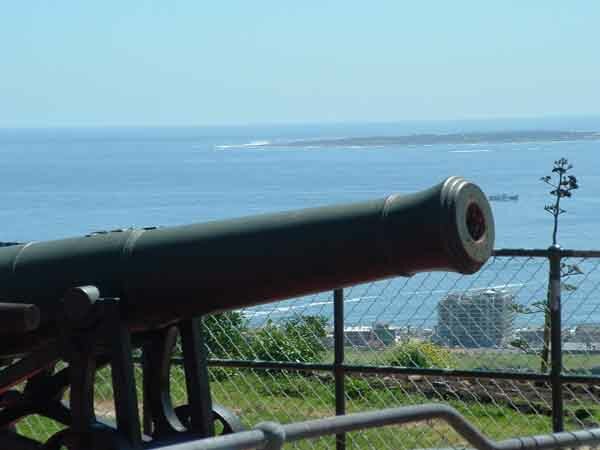 In 1902 it was decided to move the gun from the Castle to its present position on Signal Hill from where it overlooks Cape Town, the harbour and Table Bay. The Lion battery as it is called, has been fired in excess of 31300 times since it was installed on Signal Hill. On the 4th August 2002 the gun celebrated its centenary of being on Signal Hill. The cannon site is opened for tourists every day and they gather at 11.30 to watch the firing of the gun at 12 noon. Two cannons are utilised, one as a back up to the other. They were cast in 1791 and 1794 respectively. Each day Chief Petty Officer Dudley Malgas has the duty of loading the cannons with a 1.5kg charge of gunpowder. At three seconds before twelve o’clock one cannon is electronically fired from the Astronomical Observatory in Observatory, about 8 kilometres away. If the first shot should fail, the second cannon is fired immediately so that Cape Town always has the correct time. Signal Hill itself is also a tourist attraction. 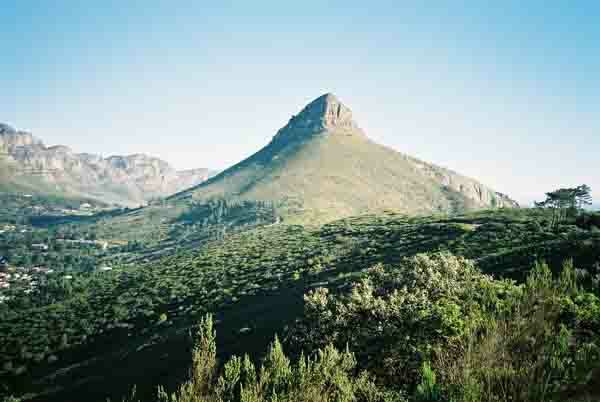 The hill is situated to the right of Table Mountain, as you look at it from the city. Signal hill and Lion's head look like a large lion lying facing Table Mountain. Kloofnek Drive runs up from the city and over the the neck between Table Mountain and Lion’s head. As you go over the crest of the neck you turn right and drive up onto the Signal Hill drive which is a narrow road winding its way up the body to the rump. As you enter this drive, you will see Lion’s Head on your left, towering above you. If you are energetic, you can climb up the path that leads to the top. There are some chains right at the top to help you over the very steep parts. The view from the top is quite spectacular. 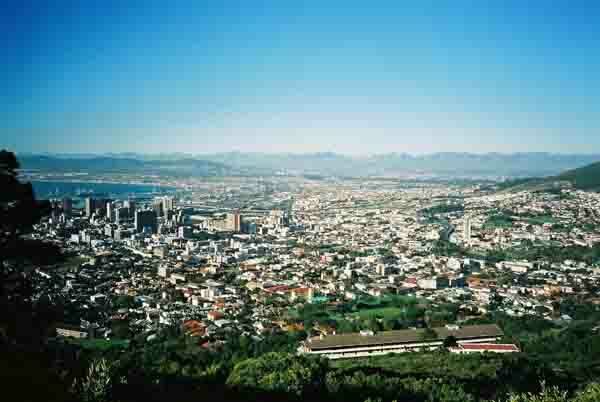 We continue on along the winding road and to the right you can look down onto Cape Town and the City bowl. This is the residential part of Cape Town, built on the lower slopes of Table Mountain. Lifting your eyes from here, you can see the Hottentots Holland mountains in the distance and in between them the area called the Cape Flats. This is the farming area of Cape Town and also the place where most of the squatter camps and townships are found. If you look slightly to the right, you will see False Bay glinting in the sunlight in the distance. 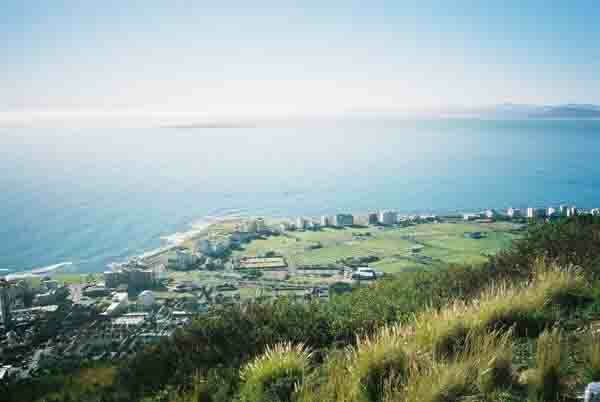 Driving further along you, reach a vantage point where you can look out over Table Bay. In the middle of the bay you will see Robben Island and around it the many ships waiting to be taken into the harbour. If you watch closely, you will also see the ferries transporting visitors to the island and back. Moving even further around the top of the hill, you face north and look down onto Sea Point and Green Point with the Green Point lighthouse sitting on the edge of Table Bay. Camps bay beach is like a jewel, shining in the sunlight with its azure blue water and its pristine white beaches lined with tall palm trees. On the slopes above the beach you will find the residential area. An evening visit to Signal hill is a must, especially on a warm summer’s evening. Bring your picnic basket and a couple of bottles of wine and watch the sun set. As the sun sinks into the sea in the west, the lights of Cape Town come alive on the east of the hill, twinkling like stars on a clear night. In the summer months Table Mountain is lit up by spotlights and is very beautiful as all the crags and caves are highlighted. For those of us who know Cape Town and its moods, Lion’s Head has particular significance to us as a weather forecaster. One glance at it will tell if it’s going to rain or not. If there’s a layer of cloud around its head, expect the worst. Cape Town has many moods, come and experience them for yourselves.